The website chavtowns offers the following modest list of negative aspects of Portsmouth. "The neccessity of living in the midst of the diabolical citizens of Portsmouth is a real and unavoidable calamity. It is a doubt to me if there is such another collection of demons upon the whole earth." In 1979, Griffiths beat the sitting Labour MP, Frank Judd. 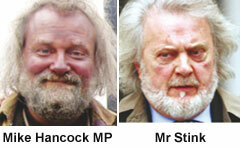 Judd was considered by people of all political persuasions as being the most hard-working MP Portsmouth has had. His accessibility, both at his advice centre and on his regular visits to offices, factories, clubs and hospitals is legendary. He championed the cause of the underpaid, homeless and unemployed and was a great believer in community values. Ennobled in 1991, Judd is an expert on issues related to the developing world and human rights. Following his election defeat, the next day's Evening News reported 'Poll Triumph for Thatcher' on the front page, heralding the end of Portsmouth-born James Callaghan's Labour Government. Griffiths held Portsmouth North until the 1997 election. Portsmouth ( often referred to as 'Pompey' ) was founded on Portsea Island as a naval base. The harbor used by the navy, Portsmouth Harbour (in Britain it is common to insert the 'useless letter u'), lies to the west and access to this harbor (from the South) is guarded by the existence of the Isle of Wight - ships have to sail up either Spithead or the Solent, which are approximately 10 kilometers or so wide, and further protection was provided by three forts built mid-channel. Additionally, there is a 'submarine' (i.e. below water) barrier from just east of South Parade Pier in Portsmouth to one of these forts - Horse Bank Fort. This was not a protection against submarines (the water is too shallow) but against torpedo boats. There is a channel from the harbor out to sea which is maintained at a depth of 9.5 meters (w.r.t. chart datum, ie. low tide ). To the east is situated the shallower Langstone Harbor, which is a bird reserve among other things. To the North, Portsea Island is separated from the "mainland" by Port Creek which is all of about 20 meters wide (at most, depending on the tide). However in the past, Port Creek was much wider stretching across where the present-day M27 motorway is. Nowadays the city stretches about two kilometers or so north of Port Creek, but the only way to enter the center of Portsmouth by road is from the North. There are ferries to/from Gosport in the West and a much smaller ferry in the East to/from Hayling Island. There were plans at one stage for a tram/light railway between Portsmouth and Gosport using a tunnel under Portsmouth Harbour but that appears to have been laid to rest, in common with several other schemes elsewhere in the country. 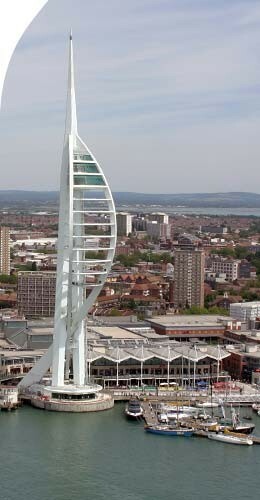 Portsmouth received its first charter in the time of Richard 1. It was centered on a natural landing place for boats - The Camber. The Camber was formed by the deposition of shingle at the mouth of Portsmouth Harbor, and similar formations can be detected at the entrance to Langstone Harbor, i.e. as well as on the other side of Hayling Island, and across Portsmouth Harbor on the Gosport side. Over the years the shingle banks around the Camber have been built up into Broad Street and Town Quay. At the end of the quay nowadays stands The Bridge Tavern in splendid isolation - the bridge has been demolished and left no trace. The car park behind it was once a coal yard, and prior to this it was occupied by houses. It offered an advantage to some shipping from the Continent who preferred to land thier goods here for further transportation to London, rather than actually attempt the hazardous journey to London themselves. Further north a dockyard was built (which obviously still exists in an expanded and altered form). In 1212, King John ordered that the dockyard be enclosed by a defensive wall - the work was completed in 1711 !!!. At that time most of Portsea Island was marshy and about a meter below sea-level - there was only one secure track from Portsmouth thru the island to the mainland. Three hamlets occupied the island - Bocheland (Buckland), Copennore (Copnor) and Frodintone (Fratton), these names being recorded in the Domesday Book, although the latter name also appears as Froddington in the name of a local pub. Silt from the dredging of Portsmouth Harbor was deposited on the island and this proved an important factor in reclamation of much land. The town eventually received its own wall, although not before it had been sacked by the French four times in the 1300s, being burnt virtually to destruction (1338, ,1369, 1377, 1380). These raids led to the immediate construction of a basic earth wall and moat. The later stone wall was supported by the Round Tower of about 1418, built for the purpose of deterring any armed enemy ships. In 1422, a chain was built across the harbor entrance, winched from the Round Tower to allow it to be raised at times of crisis. In 1494, the Square Tower was built to complement the Round Tower. Broad Street was left outside the fortified town and this developed into a 'red-light' type area, known sometimes as Spice Island (a name you can still see today), it actually being an island at that time because a moat had been built in front of the wall. At one time there were 26 pubs along this road. The only gate still in its original location is Landport Gate, on St. George's Road. This was apparently the main entrance to the city and it was designed by Nicholas Hawksmoor, dating from 1760. The gate which used to lead to Spice Island has now been moved to Burnaby Road. Despite its association with the navy, Portsmouth was for a long time a garrison town. There is still a Garrison Church (gutted by an air raid in January 1941) which stands on the site of the Domus Dei , an institution for wounded and convalescing soldiers. It was in the Domus Dei that Charles 2 married Catherine of Braganza - this event is mistakenly transplanted in some histories to the Garrison Church (there are some technicalities involved here). Adjacent to the Garrison Church, archaelogists have disovered a 13th. century tunnel, but they have been forbidden to investigate in the Church grounds themselves by the Ministry of Defense. It was in the entrance of the church in the Domus Dei that, in 1449, the Bishop of Winchester, Adam Moleyns, was murdered by soldiers over what appeared to be a dispute over pay, although there were other factors. Portsmouth was officially excommunicated for fifty years, whch meant that religious services could not be held in the town. The Old Portsmouth area itself was severely destroyed during the Second World War, which did however prove a bit of a boon for archaelogists. For example, the banks of the Camber originally stretched further back into present-day White Hart Road, and traces of this were found. An obvious change during re-building was the division of Oyster Lane. The 'severed' section leading into White Hart Lane is now called French Street. Formerly there was a chain ferry across to Gosport - further information is given at the end of Broad Street. It was not unknown, in former times, for the military to queue up along Broad Street, waiting their turn on the ferry. It is very noticeable from across the Solent, and indeed is very clearly visible from the top of Shankill Down, some 20 kilometers south, on the Isle of Wight. It is also visible, for those who are particuarly looking for it, from the A27 east of Havant. For an alternative view over Portsmouth, you could visit Portsdown Hill which rises to the North of Portsmouth. Forts and military establishments are prominent on the hill, the origin of most being dubious given that there possibly no obvious enemy power threatening Portsmouth at the time (1850s or so), unless the French 'threat' really was real at this late time. One of the forts at the western extremity, Fort Nelson, is now the Museum of Armouries, which I can recommend - entry is free. Just like Ian Hayward (11. Dec), the concept of a celebration of Trafalgar makes me despair. Looking at the bigger picture, what we have is a victory of arch-reaction against the more democratic values of the French Revolution. Wellington was able to carry his anti-democratic ideas into later life and therefore be viewed in his true light (although I will never understand how he made the back of a five pound note). Nelson was saved this by dying in battle, but his previous anti-democratic actions in Italy speak volumes. The military aspects are more debatable, but it most certainly seems to have had less effect on the French than official British history would lead us to believe - only a couple of months later, France had won the Battle of Austerlitz. French troop movements for this battle were such that at the time of the Battle of Trafalgar, there was no chance of a French invasion of Britain. But, as Michael Howard's defence spokesman, he has been trying. A couple of weeks ago he said that the government would be committing an act of "lunacy" if, as expected, it decided to mothball four destroyers. If the cuts were made, it was reported gravely by the papers that carried the story, the Royal Navy would, for the first time in 300 years, have fewer surface ships than the French navy. The complete lack of panic on Britain's south coast with which this revelation was greeted can be explained in several ways. One is that Napoleon is dead, and we no longer see the French navy as a threat; naval parity with France, as an electoral platform, is too recherche even for the Conservative party. Another is that the ships concerned were designed when Soames - now 54 - was a teenager, and proved their fallibility in the Falklands decades ago, when two of them were destroyed by the Argentinians. A third is that we still have more submarines than they do, so war with France remains an option, should a future Tory administration deem this appropriate. These are difficult times for lovers of the idea of a big Royal Navy - the 900 major ships of 1945 or the 950-ship fleet of 1805, the year of Trafalgar. Now there are only 36 left, not counting submarines and minehunters. Nostalgists can go to the cinema and enter the enchanted maritime kingdom of Master And Commander: Far Side Of The World. They can yearn for an era when Britain was respected on the high seas, when Russell Crowe-like heroes wore powdered wigs and prepubescent midshipmen had their arms amputated without anaesthetic. Then they can come out into the drizzle over Devonport, see the few grey hulls in the water, and wonder not only at the inexorable shrinking of the fleet, but the indifference of the general public to whether the navy is big or small - or even, Nelson forbid, to whether Britain, the island nation, has a navy at all. Psychologically, the British have been in retreat from the sea for generations. The oceans which once were our highways to the world, doors to adventure and wealth, have come to be associated with economic decline and restriction. The Royal Navy couldn't prevent the empire dissolving. The Falklands were only won back at an enormous cost in blood and money. The navy couldn't stop the British merchant fleet, or the British fishing fleet, shrinking to shadows of their former selves. It couldn't even protect trawlers against the gunboats of Iceland - a country that has no defence budget. The great transoceanic journeys which young imperialists and colonists once made are still being carried out by their British descendants, but by air, not water. As the French raise taxes on cigarettes and alcohol, the cross-Channel ferries and their loads of booze-cruisers may even fade away. The concept of a celebration of Trafalgar makes me despair. Looking at the bigger picture, what we have is a victory of arch-reaction against the more democratic values of the French Revolution. Wellington was able to carry his anti-democratic ideas into later life and therefore be viewed in his true light. Nelson was saved this by dying in battle, but his previous anti-democratic actions in Italy speak volumes. In 1799, Naples had been set up as a Republic by the liberals, with the aid of the French, while Nelson and the British had aided the Monarch (incidentally, these events provide the background to the opera Tosca). The Republic was overthrown by the Monarchists, but the terms of the armistice forbade reprisals and gave safe passage for those who wanted to leave Naples. When Nelson re-appeared on the scene, he totally ignored these terms, and started a string of brutal actions against republicans. A particular name to mention is Caracciolo, the Admiral of the Neapolitan Navy. Nelson had him summarily tried and then hanged aboard his flagship, the Minerva. People who had laid down their arms in an honourable peace were treated as common criminals, Several thousand died either by the gallows or in 'mopping-up' exercises. The English Consul wrote of :'the stab our English honour has received in being employed to decoy these people, who relied on our faith'. There were anti-democratic atrocities in Britain in this general period - in 1839, the British Army opened fire on a gathering of Chartists and shot dead over 20 of them. By this time, Wellington was expressing the idea that only a small number of soldiers was needed to deal with Chartists because :"unlike the French, they are English and at least they know when they are doing wrong". This type of arrogance needs to be actively opposed and denigrated not celebrated in major military or naval displays. The military aspects are more debatable, but it most certainly seems to have had less effect on the French than official British history would lead us to believe. On the very day before Trafalgar, Napoleon had accepted the surrender of the entire Austrian Army in Ulm, Bavaria. Six weeks later, France had won the Battle of Austerlitz. French troop movements for these campaigns meant that, at the time of the Battle of Trafalgar, there was no chance of a French invasion of Britain. The French ships at Trafalgar were not travelling to the Channel but towards the Mediterranean. 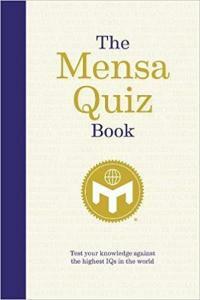 There are many factors about which it is hard to find definitive answers. For starters, I would like to know who was responsible for starting the war in the first place. The war had started in 1803, and if Britain itself had started it, which is well within the realms of feasibility, then the last thing we should be doing is celebrating the fact 200 years later. One quote seems to sum it up :"Celebrations of Nelson are inappropriate to an age which wants the world to recognise the indispensability of respect for human dignity". I am reminded of a Second World War refugee whom I heard recently on the radio. 'I was only in this country for a short while', she said, 'before I began to realize that many people in Britain thought that Dunkirk was a victory'. In 1805, Britain went to war (possibly caused by itself in the first place), allied with Austria and Russia. Within a short time it turned to disaster. The day before Trafalgar, the entire Austrian army surrendered in Bavaria. Six weeks later, France won the decisive Battle of Austerlitz, making it the supreme military power in Europe. Jena and other battles in 1806 consolidated the situation. How does Britain react - by doing a 'Dunkirk' and trying to make out that they were really the winners. Tolstoy's 'War and Peace' begins in July 1805, just as the war is starting, but nowhere in this great tome will you find a reference to Trafalgar. Recently, in response to viewing the French film 'La San Felice' on TV5, I have been trying to get hold of the book itself, by Alexandre Dumas. This book tells of Nelson and his less-than-honourable behaviour during the Naples uprising in 1799. Portsmouth Library had no copy of this book and, in fact there was some confusion trying to get hold of a copy through Inter-Library Loans. I would like to know why a book by a popular author like Dumas, a book which itself appears to be popular on the Continent and of which Dumas himself was very proud, should be so hard to get hold of in this country. I have to wonder whether some form of unofficial 'censorship' has been operating here. Point of Information. The book does not appear in English as 'La San Felice'., but in two volumes called 'Neopolitan Lovers' and 'Love and Liberty' (the latter title is also the name of a totally different work by Dumas). It might also appear under a different title as well, I don't know for sure - as I said it is confusing. The origins of Southsea as a separate suburb possibly began with the draining of the 'Great Morass' in about 1785 to become Southsea Common. This area only became Council property in 1922, when they bought it off the military. Being directly adjacent to the shore, this state of affairs has obviously shaped the nature of the seafront - it would otherwise have been built up completely nearer to the shore. The castle is recorded as 'Southsea Castle' in a map of 1724, although it was unlikely to have been called that originally (it was built in the time of Henry 8, from 1544). The original 'village' was centered around Castle Street. The earliest developments were the five terraces - Hampshire, Landport, King's, Jubilee and Bellevue - which nowadays form a continuous road between the current City Center (almost) and the beach (almost). Originally these terraces would have been adjacent to the town walls and were built around 1810. From this time onwards, up to the time of the First World War, Southsea expanded eastwards across the southern part of Portsea Island. The area betwen Castle Road and Victoria Road South was built up between 1835 and 1860 as 'quality' housing. A prominent architect during this period was Thomas Ellis Owen who built properties in Kent Road, Queen's Terrace, Sussex Terrace and Portland Terraces. Apparently he was attempting to build in the style of a garden city. Particularly worth a view is his St' Judes Church on the corner opposite the northern end of the shopping precinct in Palmerston Road. He built the second St. Mary's church also. After the 1870s, east of Victoria Road, there was new building in the Campbell Road / Outram Road area. As building proceded most was put up in the cramped manner typical of much of Portsmouth, a city where space is at a premium. The parish church of Portsea Island, as opposed to Portsmouth. The present church was built from 1887, and consecrated in 1889, half the sum needed being donated by W.H. Smith himself. It weas built in Perpendicular Gothic style.The Great East Window was destroyed by a bomb landing in Woodland Street. Originally a Saxon Church mentioned in the Domesday Book. Thomas Ellis Owen, the architect of early Southsea, built the second St. Mary's, but this proved unsatisfactory because of low light levels.. The first church saw the baptisms of Isambard Kingdom Brunel and Charles Dickens. As of 2006, an appeal was in train to raise the approx. £ 100,000 needed to restore the 50 meter tower. In its own little way, Portsmouth has been supporting the introduction of the metric system, with its fingerposts giving distances in meters and kilometers. Paradoxically, despite metrication being more or less complete in this country, it is actually against the law to have metric units on road signs - these fingerposts are obviously for pedestrians. In the best tradition of those narrow-minded, insular persons who are proud of the fact that Britain was the last country in the world to adopt decimal currency (and are probably in the same tradition as those who delayed the introduction of the Gregorian calendar for a couple of hundred years, and then rioted when it was finally introduced), there exist groups who are still trying to oppose the metric system. These fingerposts have attracted some attention from those who paint over metric units, but as you can see on some of them, the Council has actually bowed to pressure and inserted the old measurements alongside the metric units. The city's proximity to France presumably is influential here, but it would be wrong to suggest that every inhabitant is conversant with the metric system. This is despite the fact that the metric system has dominated the world for over a hundred years. It was actually formulated before 1800 by a group of world-class mathematicians like Laplace, Lagrange etc.. In contrast to the attitudes of the 'Luddites', I can tell you that all the biographies of these mathematicians that I have read do not decribe the metric system as a mistake. Since the metric system has dominated the world for over 100 years, everyone in Britain was born into a world dominated by this system, and by rights should therefore have made sure they knew all about the it. Furthermore, they would have know that its introduction into Britain was on the cards. These people who profess ignorance of the metric system remind me of the time I used to work in a pub in Liverpool - when surrounding pubs ran out of beer over Christmas or whatever, our manager would always say : " We had an advantage over the others - we were told that Christmas was going to fall on December 25th. this year". After all, this is the 21st. Century - well time that we had a measurement system in line with the rest of the world !! Alistair Darling's view that buses are better than trams for England was apparently reinforced by "ftr", hailed by its promoter FirstGroup as a "totally new concept in public travel". Last March he attended the launch of ftr, which turned out to be just another design of bendy bus. A Freedom of Information response shows that Darling also discussed the totally new concept in a meeting with FirstGroup chief executive Moir Lockhead in October. At other meetings Lockhead explained ftr to junior transport ministers. Lockhead's message that ftr offered a cheap alternative to trams was music to Darling's ears. Darling had already pulled the plug on Oldham-Manchester trams and stalled tram schemes for Leeds and Portsmouth. Three weeks after discussing ftr with Lockhead, he axed the Leeds and Portsmouth schemes. Announcing his Leeds decision, he said the city had the chance "to develop a first of its kind, showcase bus system". What could he have had in mind? Of course, it's just coincidence that unregulated buses in Leeds, Portsmouth and between Oldham and Manchester are mostly run by... FirstGroup. PS: FirstGroup's website explains ftr is texting shorthand for "future" - appropriate because the website promises: "The first 'ftr' services will start in York at the beginning of 2006." The concept remains in the ftr, while the reality of the prsnt is widespread anger at FirstGroup's huge bus-fare rises in York. The city council is so cheesed off it voted to censure the government for leaving Maggie Thatcher's bus deregulation intact. 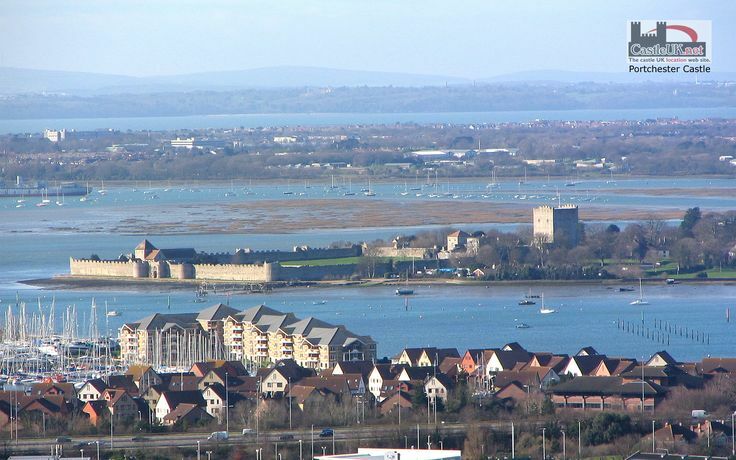 To the west, and very visible from the M275 at the top of Portsmouth Harbour, is Portchester Castle. This is the most westerly and best preserved of the 'Saxon Shore' castles from Roman times (3-4th centuries), castles which are traditionally held to have been bulwarks against Anglo-Saxon invasion - although there are dissenting voices. Only the walls can claim to be Roman, everything else is later. Portsmouth is twinned with Duisburg on the River Rhein and with Caen in Normandy. While the latter twinning seems quite dormant, that with Duisburg is 'weakening' but still has some signs of life. The Facebook page below started off as a page for the Portsmouth Duisburg Anglo-German Society, which does not still exist formally. However a group of 30+ from the Duisburg Portsmouthfreunde does still visit every year. The Portsmouthplatz in Duisburg is the name for the square outside the main railway station. By 2012 this area was extended by roofing over an adjacent autobahn and the media etc. started using the name 'Bahnhofsplatte'. 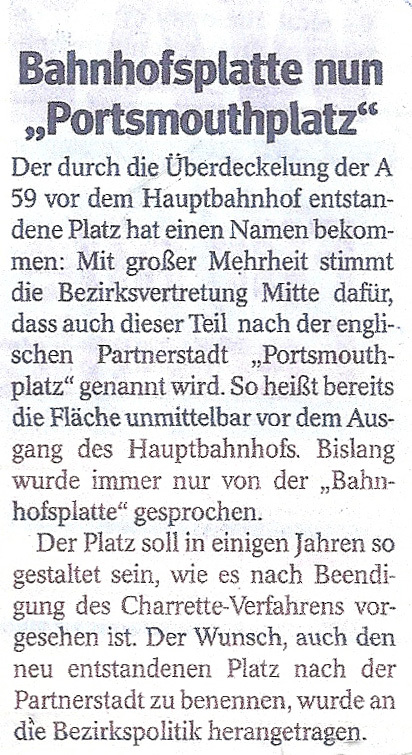 In 2013, it was formally announced that the entire extended space will be called Portsmouthplatz. There is a rather tenuous link with Charles Dickens, who was born here during the time his father worked in the naval administration, but who left for good when he was three years old. Dickens' birthplace is now a museum. There is a link with H.G. Wells. He worked in a drapers shop in Kings Road, on the corner with St. Pauls Road (see photo), an experience which provided the basis for The History of Mr. Polly and Kipps (filmed as Half a Sixpence). This shop is long gone, presumably a victim of the wartime bombs which completely ended Kings Road as a shopping street. Within five minutes walk (at most) of Kings Road / St. Pauls Road is the City Museum, which has free admission. Portsmouth was nominated by Spike Milligan as one of the things to be put into Room 101. The original Room 101 was in George Orwell's 1984, a place where people people were tortured. In the TV program of the same name, celebrity guests can put things they hate into Room 101, but only if they can persuade the presenter, Paul Merton, and the audience. In this case, Portsmouth did get admitted. It also came out that at times in the past, Spike had been billed as Spike 'I Hate Portsmouth' Milligan. Ironically, one of the other Goons, Peter Sellers, was born in Southsea, although I am not sure how much time he actually spent here - his parents traveled around a lot, performing in different theaters. Portsmouth also tries to make a link with Arthur Conan Doyle, who was an impecunious doctor here for a while. In 1900 he wrote numerous articles and pamphlets in defense of British concentration camps during the Boer War, for which he was knighted. Rudyard Kipling lived at 4 Campbell Road (Lorne Lodge) from 1871 60 1876 - from the age of 6 to 11 years old. Kipling's own memories of this time are less than flattering, although there are reasons given from some circles to doubt some of the stories related by Kipling. He did actually use his experience from this time for Baa, Baa Black Sheep (1888), The Light that Failed (1891), as well as mentioning it in his autobiography Something of Myself. What is certain is that Kipling and his younger sister were left with a couple who advertised their services while their parents returned to India. This by itself seems to have been a fairly usual practice. According to Kipling himself, a;though he got on with the husband, a former sailor who unfortunately died, he suffered hell from the wife and their son who was a few years older than Kipling. Incidentally, Campbell Road is named after Colin Campbell, the C-in-C of the Indian Army under Palmerston, and the general area of the-then Havelock Park (Havelock Road is still the name of a road off Campbell Road, is named after General Henry Havelock, who was responsible for the relief of Cawnpore and Lucknow during the Indian Mutiny. This is a nice description of the Tricorn that I came across on a BBC site. The Tricorn is a multi-storey car park complex in Portsmouth. It was voted the third ugliest building during the 1980s, since when the first two buildings on that list have been knocked down. The Tricorn is soon to share the same fate, which is unfortunate because it is an exquisitely ugly building. Not just ugly like brown flared trousers, but ugly like a Goya painting, or a Bosch portrait of hell. The original architect built his prototype in the south of France, where the sun bleached the concrete a lovely, Spanish-Amercian kind of desert look. The Portsmouth weather, however, intensified the brutal grey concrete while adding strikingly dull streaks of grey rust. The Tricorn was also a 'relation' of the 'Get Carter' car park in Gateshead, having been built by the same company, Owen Luder. The Tricorn was demolished at the end of 2004. The new site being developed appears likely to tempt two department stores from Southsea, to the delight of Southsea residents, no doubt. And there is also the remains of the church in which it is often said that Charles 2 married Catherine of Braganza - but see here. The oldest dwelling in Portsmouth, Wymering Manor House, had been used as a Youth Hostel since 1962 (but has now been closed, see below). The YHA used this description : " The magnificent entrance hall and Jacobean staircases help create a special atmosphere in this Tudor manor house but it's the homely welcome which makes it unique ". From June to September, a major part of the building becomes a bat maternity roost with numbers reaching about 4-500 bats. You can read about the enormous help given to me by Mr "Battle Against Bureaucracy", on what one of Hancock's supporters refers to as my "grubby little site". The author Nevil Shute is connected with the city. His "day job" was as an aeronautical engineer, under his proper name of Nevil Shute Norway. In this capacity he was involved with the Airspeed company, which constructed aircraft at the former Portsmouth Airport. This airport is no more (which is not surprising, given the lack of space in the city) but there is a Norway Road in remembrance, as well as a more minor road called Nevil Shute Road. A plaque on 14 Helena Road announces that he lived there from 1936-1940. Portsmouth airport was opened in 1932 (note its rural setting in the photo). However, it later became enclosed by housing, bringing the inevitable complaints. The end was hastened by two air crashes in 1967. It was a foggy day and the landing strip was grass and the planes skidded when they landed and ended up across the Eastern Road - the 21 passengers and 4 crew were all ok. The airport was closed in 1973. In 1936, the airport was the starting point for the England to Johannesburg Race. The prize money offered varied from £4000 for first place down to £500 for fifth place. Fourteen entries were received, but only nine actually got as far as taking off from Portsmouth, on 29. September. Of these nine, only one finished, a Vega Gull flown by Scott and Guthrie in just under 53 hours. Tragically one pilot died, in a crash in Kenya. During the Second World War the airport was used by Halifaxes (although not in their bomber role) and the loading of Horsa troop-carrying gliders manufactured at Portsmouth. However I have a note from George Yalden : have found out that a prototype Halifax bomber was used for test flights at Airspeeds Portsmouth, probably 1942, and almost crashed over Langstone Harbour. After that they insisted on having a new tested plane and carried on test flights elsewhere. If I find any more information I will let you know. In 1936, there had been serious consideration into building a flying boat base on the adjacent Langstone Harbor (Southampton Water was already been used in this manner). The fact that it went down without suffering any military damage plus the preserving effect of the Solent mud has provided archaeologists with a wealth of information about life during this period. I am lead to believe that longbows are a novelty - we know about them obviously but normally any examples would have just rotted away. After unsuccesful salvage operations at the time (her masts were still to be seen rearing from the water), the ship was forgotten for 291 years until discovered, in 1836, by John Deane, the inventor of the diving helmet. Despite the recovery of some items, such as a few guns, the wreck became forgotten again. In 1965, Alexander McKee, historian and amateur diver, determined to find the Mary Rose, with the help of divers from Southsea Sub-Aqua Club. Initially they had little luck, but then in 1966 they came across an Admiralty chart of 1841, which showed the location of the wreck, coutesy of John Deane's work. With this information and using modern technology, McKee located the wreck in ten minutes. When excavations started, they had to dig for just over 2 meters to physically locate their first remains. This excavation was carried out largely by amateurs from Southsea Sub-Aqua Club and the funding was provided primarily from fellow amateur divers in Britain. As more and more items were brought to the surface, interest began to be aroused - in 1971 funds of 10.000 pounds were raised but the work still continued to be done by hundreds of unpaid amateur divers. 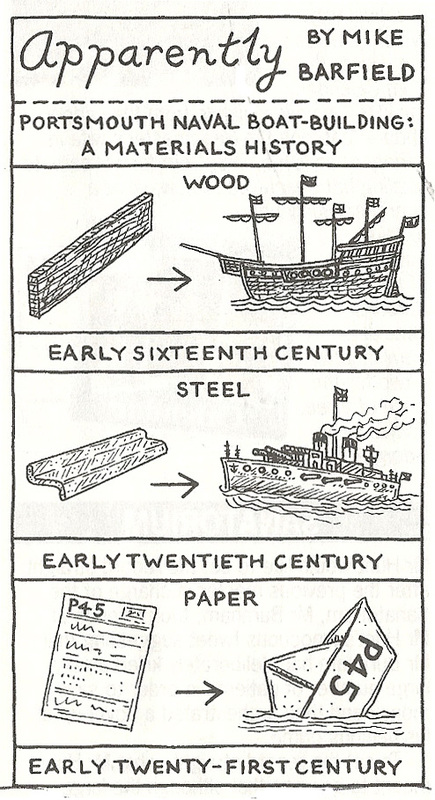 The main part of the Mary Rose was raised from the seabed in October 1982. Nevertheless a large part of the rear section still lies below the mud at the bottom of Spithead. According to a recent TV program, the favored reason for its sinking was a its top-heavy load of soldiers, on board to engage the French off the Isle of Wight. The gun ports would have been open , and while banking the top-heavy load could have swung the boat so low that water could have entered the gun ports, which were only 40 cm above the water line. There is a hint that an unfavorable side wind could have been an additional factor (although not a factor by itself). Because they were just going out to do battle the ship's deck was covered with webbing to stop the enemy coming aboard - obviously this impededed the crew getting off when it started sinking. The ship itself had been built originally in 1509 but it re-built in 1536. At the time of sinking it had 700 sailors aboard. Portsmouth has had two short-lived canals. The earliest one was built from Eastney to present-day Arundel Street. According to sources I have read so far, this soon resulting in salt-water leaking into the drinking water system, and abandonment of the canal. 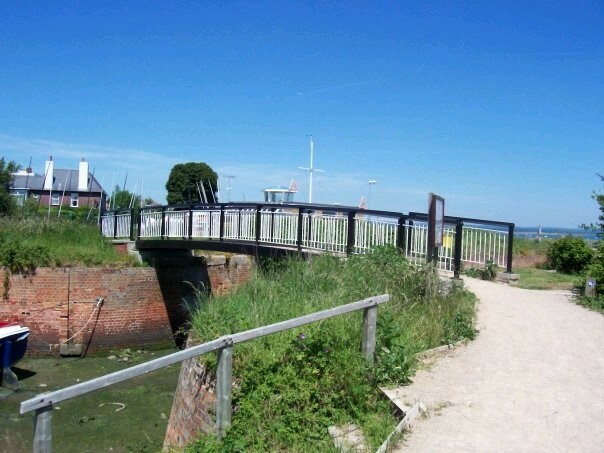 The current remains are the lock at Eastney (photo shows bridge over this lock) and a footpath westwards from there. Further west the canal was used for the railway westwards from Fratton. Following this, Port Creek, which links Langstone Harbour and Portsmouth Harbour, was straightened out and became a canal, which in form obviously exists to this day (although no longer used for navigation). Go to Portsmouth Railways on a separate site. The largest running club is Portsmouth Joggers. A more "casual" organization is Southsea Pirates, who organize sessions on an ad-hoc basis via the internet. There is a Southsea Parkrun every Saturday at 9.00 - distance is 5km. In this area there also runs at Staunton Country Park and QE Country Park, and nationally and internationally there are many more. Registration is free and this registration allows you take part in any parkrun anywhere. As you can see in the photos on their website, a lot of people take part "for fun" and children participate as well, so a good way to run regularly if you are thinking about it.